Another tasty fish and salsa combination. The beer-battered fish is good enough to serve on its own. I substituted fresh tomato salsa for the diced tomatoes and sour cream for the chipotle mayonnaise. 1. Adjust an oven rack to the middle position and heat the oven to 200 degrees. Pour the oil into a large Dutch oven until it measures 1 inch deep. Heat the oil over medium-high heat until it reaches 375 degrees. 2. Meanwhile, whisk the flour, salt, cumin, black pepper, and cayenne together in a large bowl. When the oil is almost ready, whisk the beer into the flour mixture until completely smooth. 3. Wrap a stack of corn or flour tortillas in foil and warm on a baking sheet in the 200-degree oven while frying the fish. 4. Pat the fish dry with paper towels. Add half the fish to the batter and stir gently to coat. Following the photo, use tongs to lift the pieces of fish from the batter, one at a time, allowing any batter to drip back into the bowl, and add to the hot oil. 5. Fry, stirring the fish gently to prevent the pieces from sticking together, until golden brown, about 5 minutes. 6. Remove the fried fish from the oil and let drain briefly on paper towels. Transfer the drained fish to a wire rack set over a baking sheet and keep warm in the oven. Return the oil to 375 degrees and batter and fry the remaining fish. Smear each of the warm tortillas with 2 tablespoons Chipotle Mayonnaise, then sprinkle with 1/4 cup lettuce and 2 tablespoons tomatoes. 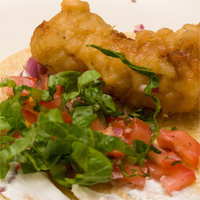 Add 1 piece of the fried fish to each tortilla and fold the tortilla over the fish. Serve with lime wedges. Sometimes you just let the ingredients at the market determine what’s for dinner. Everything but the olive oil and kosher salt were from this morning’s visit to the farmer’s market. In general I’m not a huge fan of tuna but I was pretty happy with the way this turned out – the salsa is great, especially when made with good ingredients. 1. 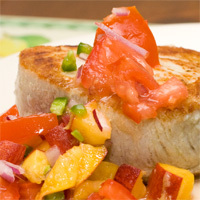 Place the tuna in a ziplock bag with olive oil and 2tbsp lemon juice. Let it marinate for 1-2 hours. Right before cooking, take it out and sprinkle some kosher salt on both sides of the steaks. 2. Mix all of the salsa ingredients in a small bowl. Add more lemon juice/salt/pepper to taste. 3. Heat a heavy-bottomed skillet at high heat. Add 1 tbsp of oil to the skillet and wait until it smokes. 4. Place the tuna in the skillet. Flip it over in 1-3 minutes, depending on how much you want it to be cooked. I usually look at it from the side and flip when it looks like it’s cooked 1/4 to 1/3 of the way through. After flipping, let it cook for another 1-2 minutes. A few weeks ago Jess and Cy came to visit on their spring break. It was great to hang out with them again, can’t believe it’s already been six months since I moved from Boston. We decided to spend the weekend outdoors. On Saturday we drove down to Big Sur, stopping in Carmel to pick up a few sandwiches (from Bruno’s) for lunch. Unfortunately, all hiking trails east of Highway 1 were shut down because of a fire that swept through last year. We found a nice trail at Andrew Molera State Park (part of this trail), satisfying our thirst for adventure by crossing a shallow stream. Wrapped up the day with a fantastic dinner at Passionfish. On Sunday we went sea kayaking in Monterey. We did a guided tour of the harbor, coming pretty close to some seals and sea lions (unfortunately, no sea otters). A few more photos from the weekend.